To celebrate my partner’s birthday we decided to enjoy a romantic Sunday brunch in Paris. After trying Le Royal Monceau and Molitor some months ago, I made a surprise by selecting the sumptuous Hotel Le Meurice, one of the few city’s Palaces (rated above 5 stars!). Rue de Rivoli is one of the most exclusive streets of Paris. An amazing history, a prime situation – passing through Le Marais to Place de la Concorde – and deserving some magical sites such as Le Louvre or Place Vendôme. 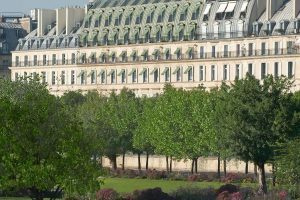 Hotel Le Meurice is undoubtedly a great part of that location, offering a high level of luxury to its guests – the famous service Palace – for accommodation, Spa, but also dining. 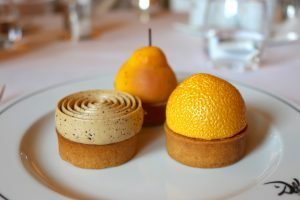 The Hotel Le Meurice hosts the two-Michelin stars gourmet restaurant “Le Meurice by Alain Ducasse” and the casual-chic “Le Dali”. Both of them open their space every Sunday to propose a unique brunch experience. Officially, the brunch is proposed by Le Dali restaurant. 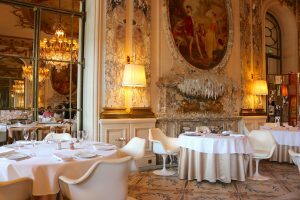 However, because of the lack of space they also open the Meurice by Alain Ducasse place so guests can enjoy its stunning scenery. 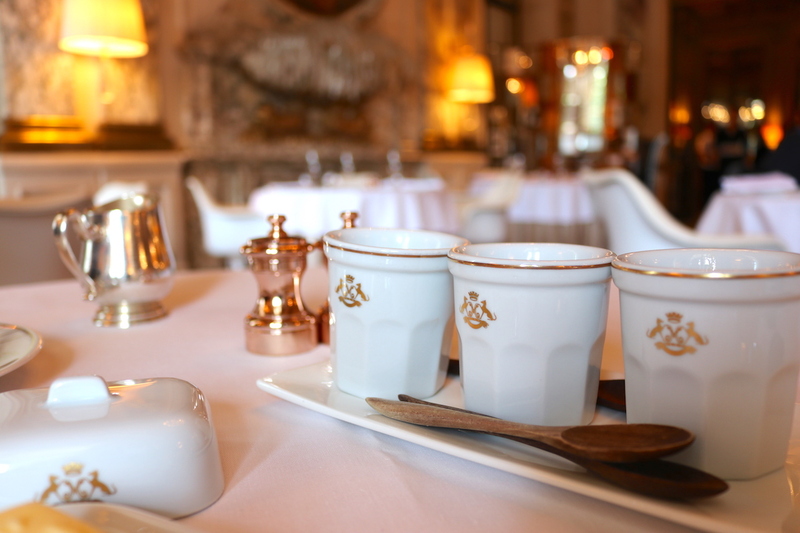 While Le Dali has a warm, cozy and contemporary design created by Philippe Starck, Le Meurice by Ducasse is much more opulent and grandiose. Original gilding inspired from the Chateau de Versailles, crystal chandeliers, ancient mirrors and paintings… That’s truly majestic and that’s definitely our recommendation if you look for a breathtaking experience! The brunch at Hotel Le Meurice is prepared by Chef Jocelyn Herland with the participation of the world best pastry Chef, Cedric Grolet. This guy is a kind of “dessert superstar” and for many people, it’s the unique motivation to choose that place! Brunch menu is composed of usual buffet selections: breakfast pastries, fresh squeezed juices, delicatessen, cooked eggs, cheeses and the choice between two à-la-carte dishes. 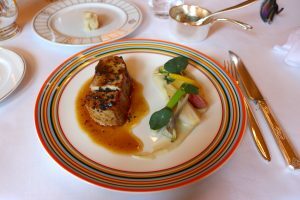 At that time we had the choice between a veal with its seasonal vegetables and truffle sauce, and a lobster façon Alain Ducasse. I particularly enjoyed my main dish, served in the pure French tradition by a very friendly waiter. Well presented, super tasty and mmmmmm… What I love truffle! Is this Palace? YES! 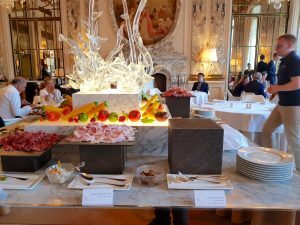 Of course, climax of our brunch was the dessert buffet put in place by Le Meurice team at last minute to preserve its freshness. Cedric Grolet is famous to reproduce fruits visually from the outside with chocolate, and surprise its guests with astonishing tastes from the inside. Mission accomplished? YES! What makes this brunch unique is the incredible interior décor and the world class desserts by Chef Cedric Grolet. The overall is proposed in a Palace cocoon and a restaurant by Alain Ducasse. What else do you need? 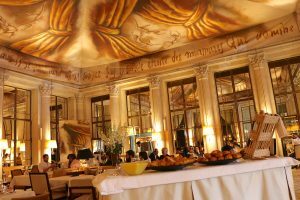 Surprisingly, the brunch at Hotel Le Meurice is not too expensive for a Parisian luxury location: 105 euros per person. Together with the palace & culinary experiences, that makes a wonderful option for a romantic or family moment. Visited on May 20th, 2018 – Unsponsored media visit.